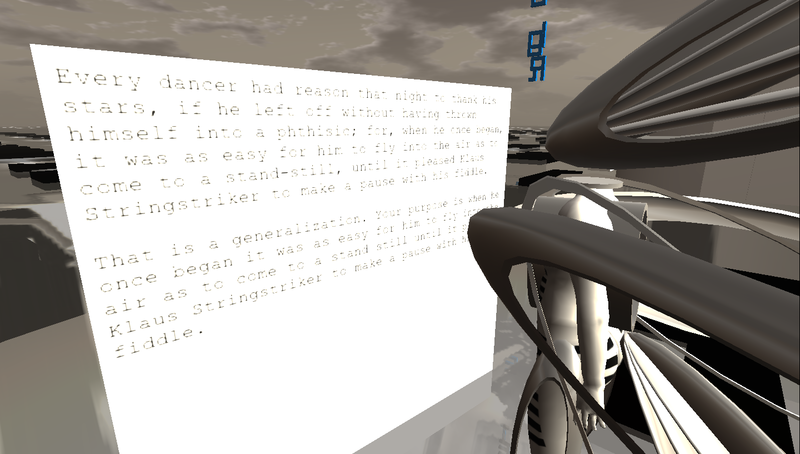 A) what input should the text generator use? take all ~30000 texts in the project gutenberg as input? take only the ~16 selected gutenberg books in the NLTK (natural language toolkit)? take any other selection of gutenberg books? which would mean someone has to make that selection and look through the available texts. B) what happens with the output of the text generator? should it go to the database? or should we leave the database for some real-time input session? we could make an appointment with some people we know, sit with our avatars somewhere on the sim, send IMs to the bots, and replicate la plissure du texte. this could be a special event, for example. if the generated text is not going to the database, will it just stream away? should it be saved somewhere? if the generated text does go to the database, how much text do we want to generate? right now, my script is throttled to one sentence every 30 seconds, that’s a lot! C) what happens to the SMS sent by the korean visitors and processed by mike’s bot? btw, you may or may not have noticed: the bot at level 1 who is speaking the text gets a response to every sentence from a pandora bot (currently only on a panel). sometimes this results in a kind of dialogue. but it’s conceptually interesting, because it couples two different autopoetic systems, and i consider this a pleating within the pleated text. it would be interesting what mike’s bot would do with these sentences. so, mike, if you’re reading this, please let me know whether we could couple the text generator to your bot! as always, comments are highly welcome! and don’t forget that we still need jobs for the bots! OK, for the first set of questions, stay with the 16 in the toolkit, make life more manageable! Second set: Real time input sessions may be an idea. Depends on whether we can find people interested – and who have the ability to generate impromptu textual output which goes beyond “wow – cool”. Not that easy I would say. No candidates that I can think of off the top of my head outside of Frigg whose career is narratology after all. Not sure I would be able to do it myself. As for saving the text: It would make sense only if we want to take this further into some kind of evolutionary text thing where the first output becomes reiterated/evolved somehow. So, the base material of yet another text based project then. If so, then how much? Surely not all of it? Third set: Here I have been thinking about a very practical issue actually. We are more or less all agreed that the “eye avatar” who acts as a tour guide is the sensible way to display the installation in Korea, right? So it will be constantly roving over a huge space. And it will be coincidental if it happens to be at the same exact spot where the SMS generated text is displayed on the SIM. A very low percentage of likelihood I would say. So, this text needs to displayed as green text on the bottom or something like that – coming from a separate dedicated bot that is. (One more bot has a job, in other words ;-). how about making a HUD for the eye-avatar? the HUD could then display the SMS text. i think we can add books manually, but we’d have to 1) select additional books, and 2) edit them a little bit (remove headers and footers of the gutenberg project at the start and end of the book).